This painting is about the Tjukurpa of Kunga Kutjara (the meeting of two ladies). Tjukurpa refers to the creation period or Dreamtime, when ancestral beings, (Tjukaritja) created the world as we know it. In the stories of the Dreamitime lie the basis for the religion, law and moral systems of life within the Anangu society of wich Tuppy Nginya Goodwin originates. This Tjukurpa tells the moving story of an elder sister bringing her missing younger sister back to her birth country after a long period of separation. The two ladies met at a rockhole, near Bumbali Creek, not far form the Northern Territory and the South Australian border. 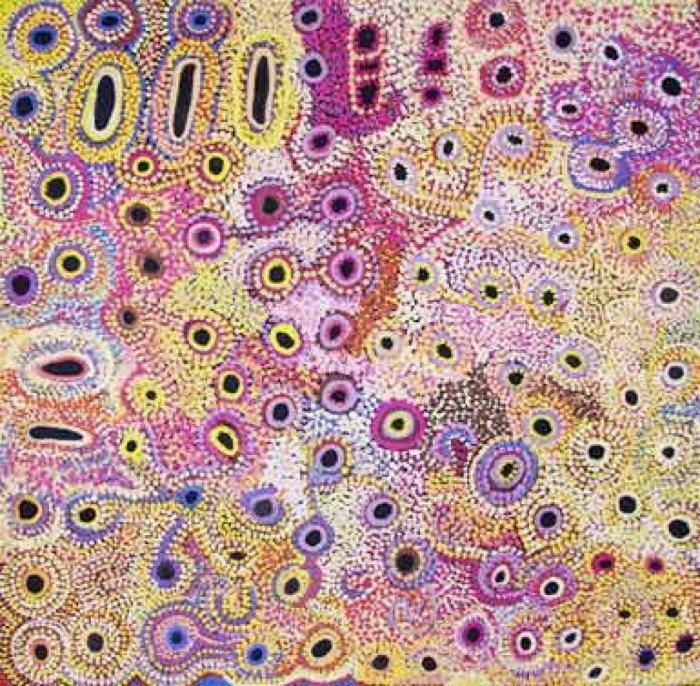 Tuppy has painted a conceptional map of the country formed of expansive colour, signs and marks of the two sisters' travels and their sacred presence in the land. Tuppy Nginya Goodwin is a senior Pitjantjatjara woman committed to fostering traditional law and culture, dancing and painting. Tuppy lives at Mimili. Her brother Robyn Kankatankatja paints for Kaltjiti Arts and her sister Margaret Dodd is a member of the Mimili Maku Arts community. 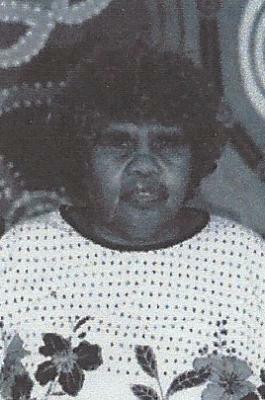 Tuppy Ngintja Goodwin was born in the bush near Bumbali Creek. Tuppy was brought to Mimili when she was a . . .